– Boot Time Defragmentation: This feature provides an ability to defragment any system files. Including page file, registry hives, hiberfil.sys file and many other files locked by the system or other applications when windows is fully running. 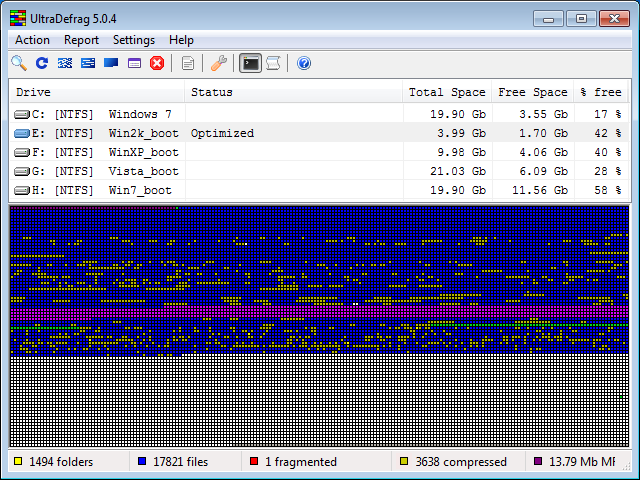 – Fast Disk Optimization: The optimizer rearranges all data and places them to the beginning of the drive. In many instances we have found, that the system is more stable and performs a lot better under load, if data is placed at the beginning of the drive. – Single File and Folder Defragmentation: After UltraDefrag is installed you have the ability to select any file or folder and deframent it. This option is mostly useful, if you have recently installed an application or a game and would like to have it defragmented immediately for maximum performance.